Smith & Wesson is synonymous with quality handguns. They are especially known for their revolvers. Their J-frame series continues to be very popular for personal protection but the J-frame is relatively new to their revolver line, dating to 1950. Before that, the small I-frame revolvers in 32 S&W Long and 38 S&W were the only small frame concealable revolvers that Smith offered. While the I-frame has not been produced since the 1960s, they are fun to shoot, are accurate, and even more comfortable to carry than the little J-frames we see in gun stores today. Back in the 1890s, Smith & Wesson wanted to compete with Colt’s monopoly on the handgun market. 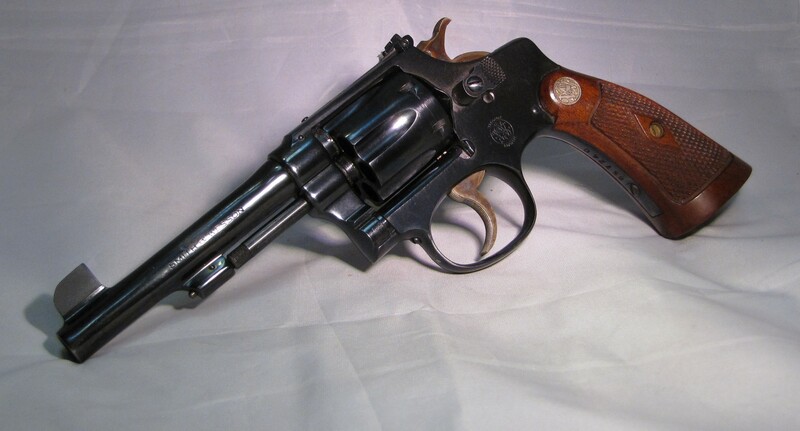 Colt’s 1892 Army and Navy models in .38 Long Colt had been adopted by branches of the US military, and many American police departments followed suit. At some point, however, there was a gradual rise in popularity in the softer shooting .32 caliber revolvers at the turn of the century. 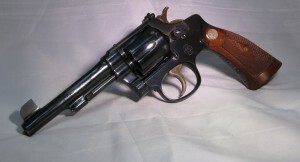 The standard I frame comes with an exposed hammer that may be cocked for a lighter, single action trigger pull, or the gun may be fired by simply pulling the trigger in double action. Despite its small size, the I frame’s narrow full grip allows for complete control of the revolver while firing. I found it comfortable to shoot one handed and two handed. On the note of size, I frames are rather small handguns—even compared to petite J frames we have today. The cylinder, frame, barrel, and top strap are all thinner than the J-frameModel 36 referenced earlier. In fact, the cylinder is a full ¼ inch thinner. Grips are classic wood in good condition. Firearm is in excellent condition, mechanically & cosmetically considering it is from 1922.